Over the weekend and for the first time in my life, I had the privilege of being present for the duration of a labor that was not my own. After a marathon labor of nearly 60 hours, my daughter gave birth to 7 lb., 10 oz. Ava at 11:50am on Saturday, January 23. It was an awesome experience, and I am excited to share some magic moments and a few gems of life wisdom I unearthed in the course of witnessing and participating in the powerful process! Even if the topic of childbirth doesn’t interest you, I hope you will stay with me because the end is quite amazing – as in goosebumps. But then I remembered it was the 22nd, and I knew today couldn’t possibly be the day because Ava’s birthday is the 23rd. It didn’t really have anything to do with my prediction at that point. It felt more like a well-established fact – as if we’d already celebrated birthdays with her, and her birthday was written on my calendar clear as day…and it was the 23rd. But how could that be? Labor couldn’t possibly last that long! Today was the day, right? It had to be. But no, it couldn’t be since her birthday was the 23rd! Anyway, it turns out my prediction and intuition were accurate, but I decided not to share my certainty with Jasmine until the day was done! From the very beginning, Jasmine’s labor did not go according to expectations. Weeks ago, one of her midwives advised her to think of her birth plan as a wish list – for you cannot control the labor experience, only the way you respond to whatever cards nature deals. That turned out to be excellent, relevant advice – for labor and life in general! Since her water broke ahead of time, labor needed to be encouraged to reduce the baby’s risk of infection. 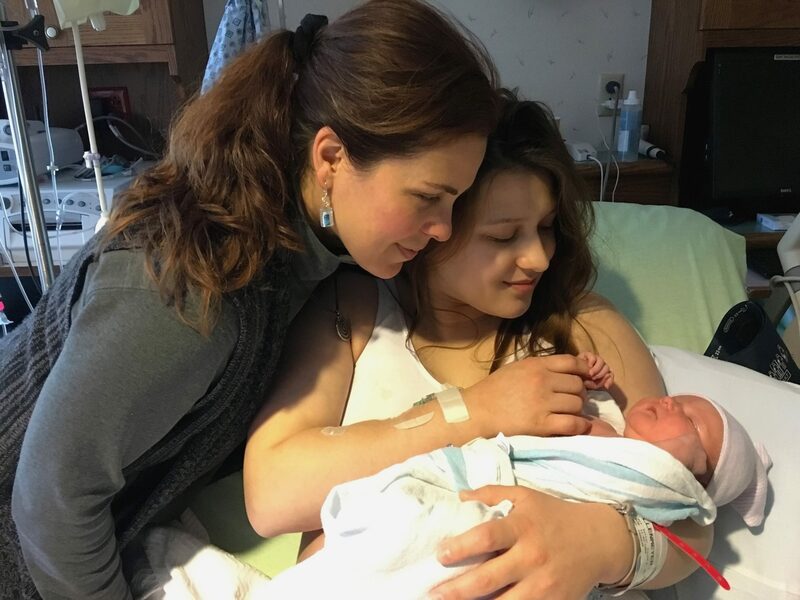 She was admitted to the hospital 17 hours later for a possible induction the following morning if contractions weren’t coming regularly at that point. By mid-afternoon, her cervix was still only 2cm dilated, which was unbearably discouraging after all that time and all those contractions. 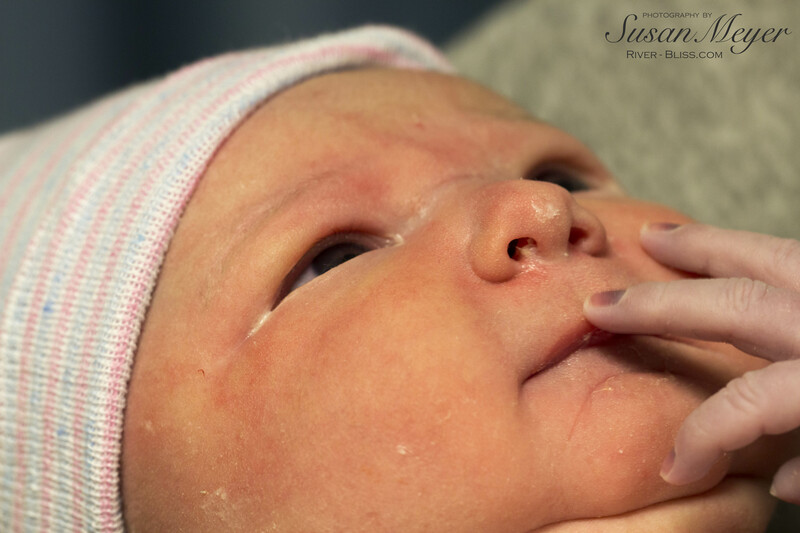 Although I’d long forgotten the physical pain of childbirth, I could feel her emotional pain completely because I experienced the same news during my own labor. The difference was that I wasn’t as exhausted as she was at that point and had the physical and mental strength (from my meditation practice?) and pain tolerance to continue focusing on one contraction at a time. I felt so powerless when she hit this wall and wished I could transfer the inner strength I found during my labors, to give her a boost! It took quite a while for her to get into hard, productive, “active” labor, and by that time she was exhausted from two sleepless nights, very anxious about the pain, and absolutely discouraged about her body’s ability to give birth naturally. She had approached labor aware of her low pain tolerance and expected she would need some pain relief. However, she was dead set against having an epidural because she had a great fear of any kind of needle going into her back. But it turned out that what she was most afraid of and determined to resist ended up being the saving grace that allowed her to relax, get some sleep, regain her strength, and ultimately push out her baby. It was inspiring to witness her being empowered by facing her fear! How often does fear cut us off from possibilities that might be exactly what we need to take us to the next level? But Jasmine did not consent to an epidural right away. It took some time. Back when I was birthing my babies, I was committed to delivering “naturally” without any pain relief and even gave birth to my second child at home. However, even I hoped she would consider having an epidural, and it was because I knew Jazz and trusted her midwife, Lisa, implicitly. As Lisa explained the options and likely scenarios given her understanding of my daughter as a unique individual, she took on a transcendent glow as if she were an angel on earth. It’s as if the light was coming through her eyes and words, and her energy felt like pure love. Her message was: I believe in you. I believe in your body’s ability to do this. I believe in your ability to do what is right for you. Here is some information based on my extensive experience that I hope you will consider. And I believe in you. She didn’t push Jasmine into having an epidural. She shared information in a loving, patient manner then gave her time to decide what she wanted to do so she could have as much control as possible over her labor experience. In fact, it wasn’t until several hours later, after Lisa went off duty and Caren had taken over, that Jasmine opted for an epidural. As I mentioned above, in the meantime when she was refusing the epidural, I felt powerless to help her push through her discouragement and exhaustion and had my own issues to face. It became clear to me that, as a helper, you can only do so much – especially if “doing” is focused on changing the person or situation. You can’t change others or do the work for them. They have to do it themselves. In addition, empathy can only go so far, and there comes a point when other tools become more useful. You become mindful of what is really needed in the situation and dig a little deeper in your toolbox. You let go of your desires and expectations for a person or situation to be different and trust the process. You discern when to step back and give someone a little space and when to lean in. It’s a lot like tending to a plant or garden. You have to work with what arises and know how much to water it when nature doesn’t deliver ideal circumstances. The long, tumultuous labor also spoke to me of the value of surrounding yourself with an excellent, trusted support network you can rely on when times get tough, and you feel confused and discouraged. People who will be honest with you and support you in making healthy, productive choices. People who value your work and truly believe in you and your ability to rise to the task and accomplish your goals. During her third trimester, Jasmine’s growing unease with her obstetrical practice and the hospital in which she’d have to deliver resulted in her reaching out (by expressing her feelings to me), connecting with the right person (whom I referred her to), and finding a midwife practice that was a perfect fit for her and allowed her to deliver at the hospital she preferred above the rest. Acting on her intuition, she drew the right people and resources into her life, and the journey unfolded from there. So when she went into labor, she was surrounded by caregivers whom she trusted completely, who understood, honored, and believed in her, affirmed her ability to give birth, and empowered her to own her experience. My favorite advice from the second midwife, Caren, is that we try out different positions and options and see what works. If something isn’t working, we try something else. You don’t stay stuck. You try all kinds of different things to see what works. If something works, you can go with it. But then you can try out something else, too. When something is not working for you or getting you where you want to go, don’t waste your time with it. Another nugget of life wisdom extracted from childbirth. 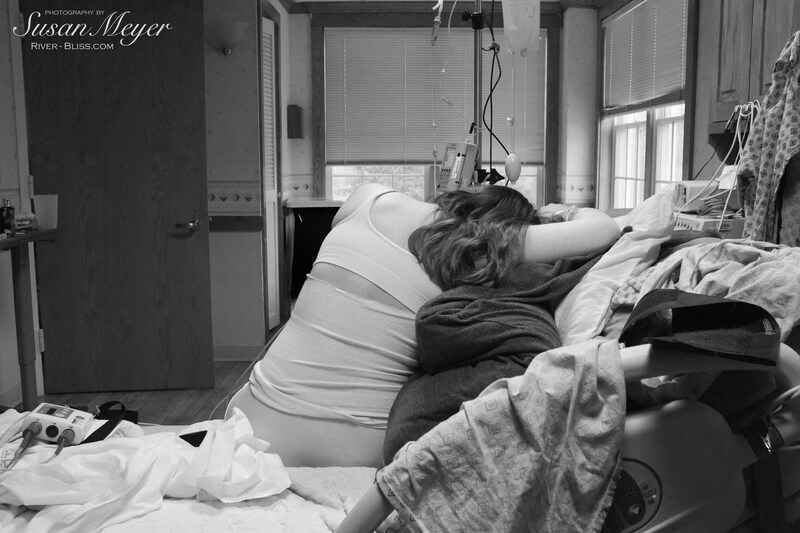 One night, I slept in the recliner next to my daughter’s bed, and it reminded me of being at my mom’s bedside when she was dying in a hospice house. It felt eerily similar. Once again, the door between worlds was swinging open, but instead of someone leaving, this time someone was entering. How refreshing to say hello instead of goodbye! I’m saving the most incredible part for last. It happened a few minutes before Ava was born. During what would be the next to last contraction my daughter pushed through, I was holding up one of her legs while the baby’s father supported her other leg. All of a sudden, I felt my mom standing right behind me, as if she had her arms around my waist! Her presence was so strong that I even turned around to look behind me. Then I remembered that the psychic medium I saw in the spring said my mom was going to help the baby come into this world, from the other side. He said it was her spiritual mission! Shivers! So I focused on the warm light I felt coming from my mom’s presence and directed that energy to Jasmine. It seemed that doing this provided her with the extra oomph to push out Ava. The next contraction, I did it again, and Ava was born. My dad showed up at the hospital a couple of hours later, and as we walked back out to our cars, he reminded me that my mom worked in that same maternity ward when she was a nursing student back when my children were young. I had completely forgotten that until he mentioned it. Then I remembered her talking about how much she loved her maternity nursing experiences. My guess is that if she had completed the nursing program, she would have wanted to be a maternity nurse. Have you seen the movie, Field of Dreams? In the movie, there is an elderly physician, Doc Graham, who had dedicated his life to caring for people. But when he was younger, he wanted to be a baseball player. On the same day in his youth, he both made his major league debut and retired from professional baseball without having the opportunity to face a major league pitcher. He went on to pursue his medical career and earned respect and admiration from the whole community. After he died, he returned to the “field of dreams” and seized the opportunity he’d missed out on during his life. Similar to Doc Graham, my mom didn’t finish her nursing degree and therefore never became a nurse, which was a lifelong dream. She chose to continue in her established career and after retiring kept her dream alive by becoming a hospital volunteer. Perhaps she was able to fulfill her dream of being a nurse when her granddaughter was delivering her great-granddaughter in a room in the same unit where she did her student nursing. Perhaps she was in the room helping Ava to be born, from the other side. It’s such a lovely thought that brings on shivers and tears when I contemplate it. Maybe she had her chance after all. I’d really like to think she did and that she is sharing our joy. 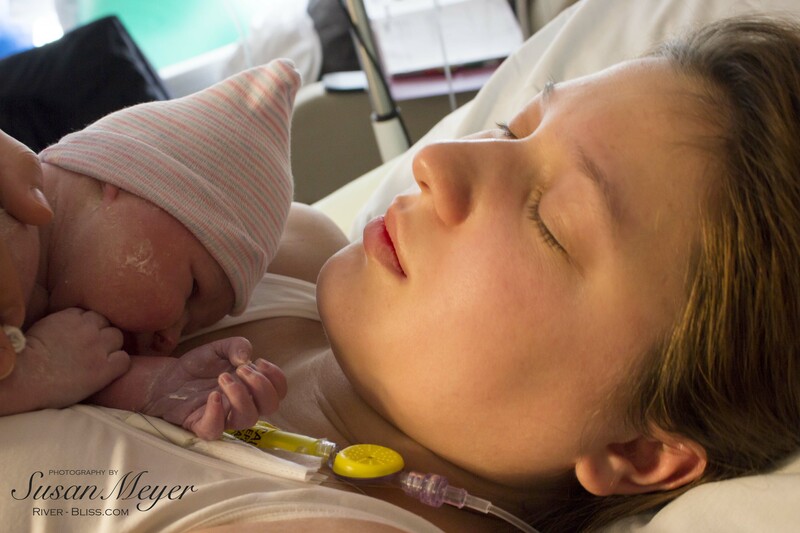 Below is our first three-generation picture and my favorite picture of my daughter and me after she gave birth. Had this picture been taken about five years ago, it could have been a five-generation picture. But I imagine my mom peeking over my shoulder and my grandmother smiling over Jasmine’s. They remain with us even if we can’t see them – and my grandmother’s last name is now Ava’s middle name. And so the circle of life cycles on. © 2016 Susan Meyer. All rights reserved. To use any or all of this blog post, include this exactly: Susan Meyer (SusanTaraMeyer.com) is a photographer, writer, clutter coach, feng shui consultant, and mindfulness mentor whose work is infused with a deep interest in the nature of mind and appreciation of the natural world. She lives on the Hudson River in Upstate New York.